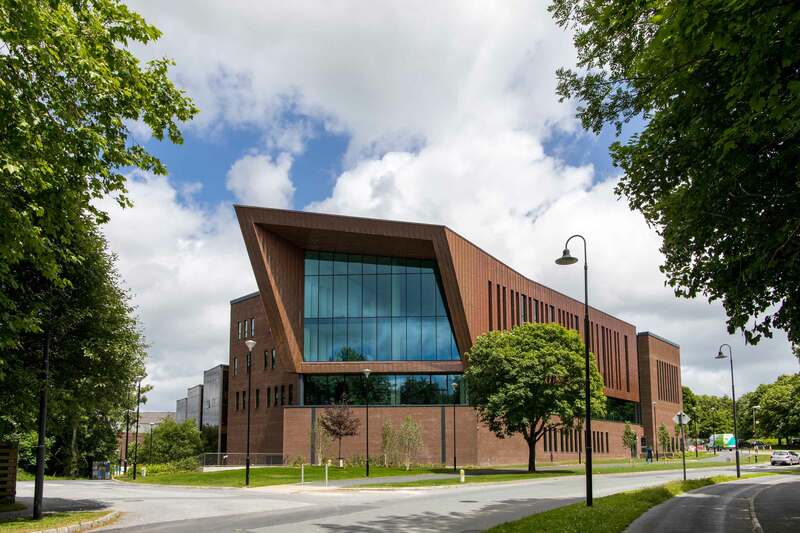 The University of Limerick has unveiled the dynamic and inspiring New Glucksman Library, designed to transform the Library and the University for scholarship in a digital age. The dynamic new library has been dramatically reimagined and extended with a sequence of interlinked, handsome, well-lit and beautifully proportioned spaces, each with a distinctive character, allowing for mood change and multiple uses, from the quiet traditional study space to much more vibrant and technology infused group spaces. Repurposing the current library and adding an extra 7,500 sq. metres the new Library has an additional 1,200 study places in a variety of learning styles that brings the total number of library study spaces to 2,200. Leveraging UL’s tradition for innovation the library is technology –rich with advanced computing, collaboration and communication spaces. Foster a vibrant learning community with spaces for academic, cultural interdisciplinary engagement. Build on scholarly library traditions with more quiet and silent study space. Enable project and group work with flexible co-working spaces and technology. Make our unique and distinct collections more accessible for research and research led teaching and community enjoyment. Provide collection storage for current and future needs. 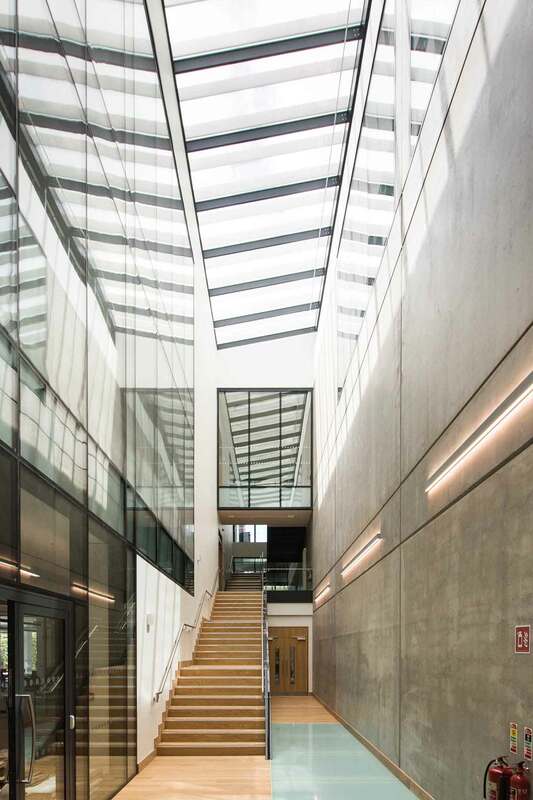 The library enjoys natural light and wonderful outlook with a series of double height spaces and glazed walls that means floors are interlinked vertically ensuring a sense of communication connecting all areas and all levels. The central stairway and light-well acts as a triumphal connector between all levels and spaces. Great effort was made to eliminate corridors in the traditional sense, creating useful spaces which incorporate a whole series of break out spaces some quiet and calm, some busy and vibrant These design features open the reading rooms up to offer dynamic and beautiful spaces, each with its own character. The placing of the new entrance in a central location is critical to ensure that the building operates as a single entity and not two distinct ‘old and new’ elements. This not only marks the formal entrance to the building but also acts very successfully, as a visual link to tie the original and new parts together in a seamless manner. Allied to the entrance are a series of spaces which allow users the opportunity to interact with the facility in terms of orientation and understanding while providing access to key services and community spaces. Adjacent to the entrance the i Zone provides a flexible information and engagement space with a range of services in one place for ease of access, including Library, IT, Disability, Peer Advisors and visitor services. It is the location for the short loan collection, laptop lending and collaborative learning spaces. A media wall will be provided to showcase UL research and student achievements and enable pop-up events. Also located at entrance level is the revitalised and expanded Special Collections area including exhibition, reading, presentation and digitisation spaces to support the use of the library’s unique resources. Specialist climate-controlled, world-class storage facilities are provided to ensure special collections are guaranteed a safe and secure environment. The café and adjacent lobby provides opportunity for social interaction, one to one and small group gatherings and informal / short duration study. Central to the building is a spine which contains the book retrieval system. The initial concept for collection storage was using compact shelving to return books stored off- site but this was space intensive and provided little additional storage. 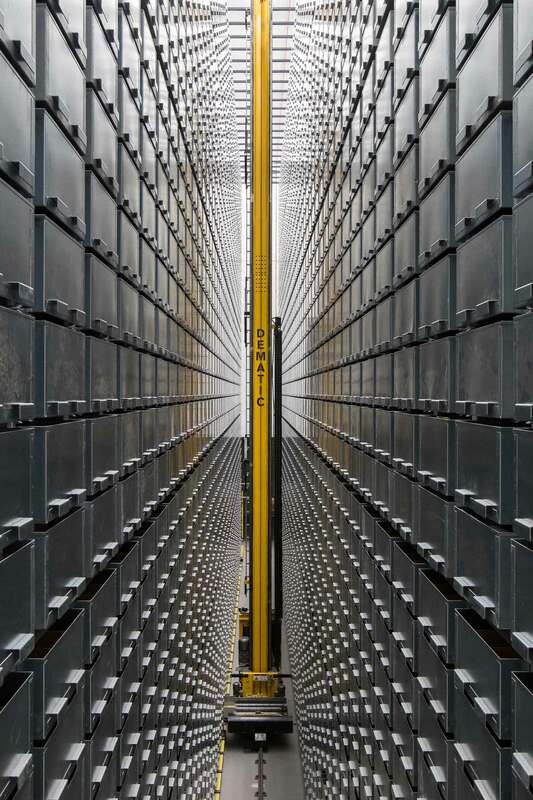 The decision to install an automated retrieval system was based on the valuable floor space it released for study and the significant capacity it provided for future collection growth. The development of the ARC – Automated Reserve Collection to store lesser used books provides additional capacity of c. 500,000 volumes that are easily accessible on site. The dedicated Digital Scholarship Studio provides open, technology rich spaces that bring together tools and staff to enable engagement with digital scholarship. Librarians, Archivists and IT professionals will offer consultations, instruction, and expertise on the use of digital technologies relating to scholarly communication, data management, use and visualization, 3D printing, multimedia production and digitization. The Graduate Commons on floor 2 is designed specifically for postgraduate students, faculty and researchers with a mix of single and collaborative study spaces, computer workstations, and social/ interactive space. The Medical and Health Sciences Library is designed for serious and intense study with an impressive double height reading room providing 75 study places and adjacent spaces for medical collections. Law Library and Silent Study is a light infused space on the third floor with skyline seating adjacent to a silent study area - a total of 120 quiet and silent study spaces. A Moot Appellate Court will allow students develop outstanding practitioner skills. This new library is designed to respond to the nexus of change in information provision, pedagogy, research practice and reader behavior. Drawing on aspects of design from libraries of antiquity with space for the exchange of ideas and from traditional libraries with space for solitary scholarship we were determined to capitalise on this opportunity to introduce new ways of thinking and technologies across the board, all with a view to the future and the inevitable change that will occur. The design is based on the growing evidence of the important relationships between the library and learning and research which demonstrates that library use increases student success, library instruction builds students’ skills and contributes to retention and persistence. Equally the design responds to the growing importance of unique collections, digital scholarship data analysis for research and the role library space has in fostering social and academic community. These principles underpin the library’s provision of a constellation of spaces, resources and expertise that will facilitate student and faculty success. The New Glucksman Library was designed and successfully realised by RKD Architects led by their design principal, Denis Brereton. RKD worked with the original library building which was designed by Hugh Murray (MOLA,1998,) based on a concept design prepared by Geoffrey Freedman (Shepley Bulfinch, 1995) and reimagined for an extension by Alexander Howe (Shepley Bullfinch, 2006) coupled with external elevations designed by Conor Pittman ( RMJM) for which planning consent was granted, (2010). Marrying these disparate parts and influences together to form a cohesive whole in a contemporary manner represented an interesting challenge which has been fully realised. Public access will be encouraged through a programme of exhibitions and cultural events. 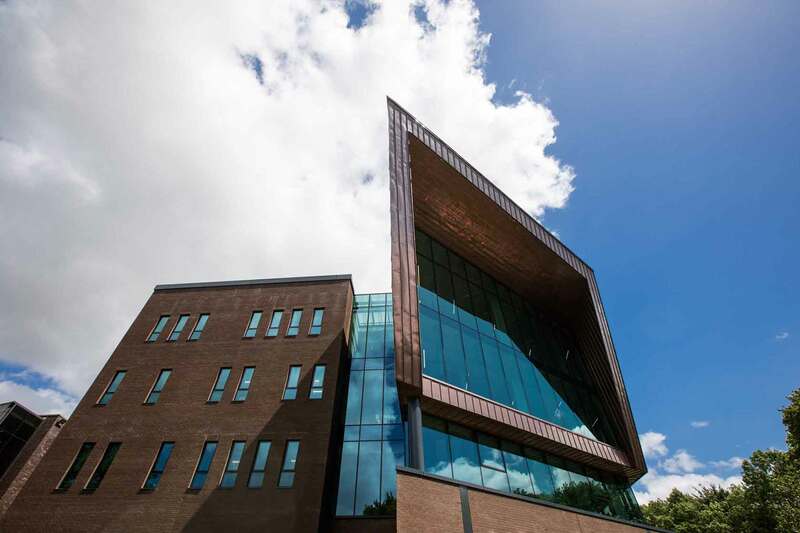 Visitors that wish to come and have a tour of the new Glucksman Library are asked to make contact with the library at libinfo@ul.ie with enquiries. The library’s build and unveiling were documented on #ULNewLibrary threads on the library’s Instagram and Twitter accounts.